Homo ergaster skull. KNM-ER 3733. Confirmed the co-existence of Homo and Australopithecines in Eastern Africa. Homo ergaster is an extinct hominid species which lived throughout eastern and southern Africa between 1.9 to 1.4 million years ago with the advent of the lower Pleistocene. 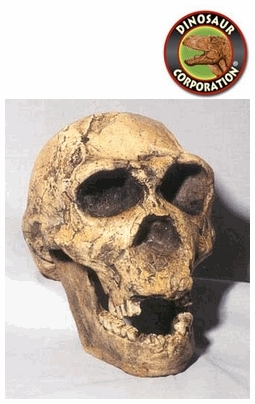 It is estimated that Homo ergaster stood at 1.9 meters (6.2 ft) tall. Remains have been found in Tanzania, Ethiopia, Kenya, and South Africa.